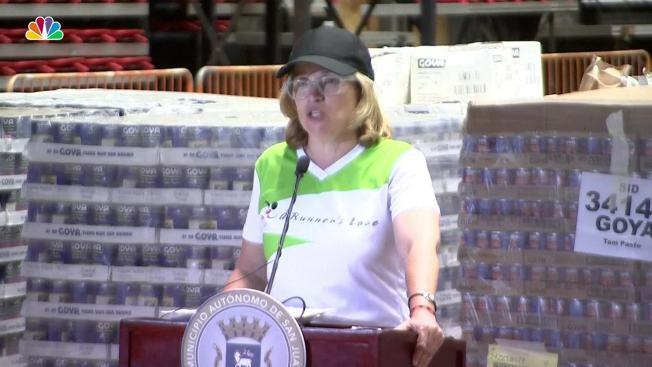 Carmen Yulín Cruz, mayor of San Juan, Puerto Rico, slammed President Donald Trump and the bureaucracy that she says is slowing down aid to Hurricane-ravaged Puerto Rico. Lin-Manuel Miranda, the composer and playwright who wrote the Broadway hit "Hamilton," slammed President Donald Trump on Twitter Saturday morning after Trump criticized the mayor of San Juan, Puerto Rico, in the wake of Hurricane Maria. "You're going straight to hell, @realDonaldTrump. No long lines for you. Someone will say, "Right this way, sir." They'll clear a path," Miranda wrote. You're going straight to hell, @realDonaldTrump. No long lines for you. Someone will say, "Right this way, sir." Trump, who is at his golf club in Bedminster, New Jersey, wrote on Twitter Saturday morning about San Juan Mayor Carmen Yulin Cruz: "Such poor leadership ability by the Mayor of San Juan, and others in Puerto Rico, who are not able to get their workers to help." "They want everything to be done for them when it should be a community effort," Trump continued. "10,000 Federal workers now on Island doing a fantastic job." Miranda responded in another tweet: "She has been working 24/7. You have been GOLFING. You're going straight to hell. Fastest golf cart you ever took." She has been working 24/7. You're going straight to hell. Did you tweet this one from the first hole, 18th hole, or the club? Trump's tweets come after Cruz criticized the response to the crisis in Puerto Rico after Hurricane Maria, pleading at a news conference Friday, "we are dying, and you are killing us with the inefficiency. I am begging, begging anyone that can hear us, to save us from dying."